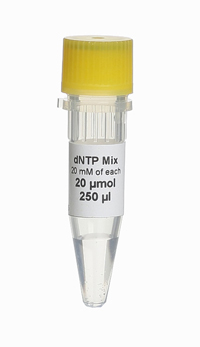 This ready-to-use mix consists of dATP, dCTP, dGTP and dTTP (each at a final concentration of 20 mM) in TE buffer, within one vial. The total concentration is 80 mM. 02-31-00020 20 μmol 80 mM PDF PDF PDF 11.5 EUR Login to buy! 02-31-00100 100 μmol 80 mM PDF PDF PDF 57.5 EUR Login to buy!